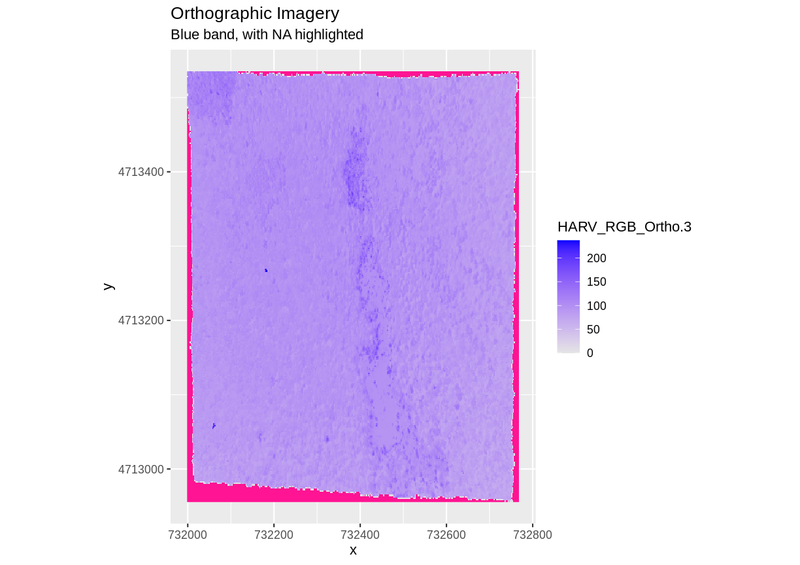 What is a raster dataset? How do I work with and plot raster data in R? How can I handle missing or bad data values for a raster? 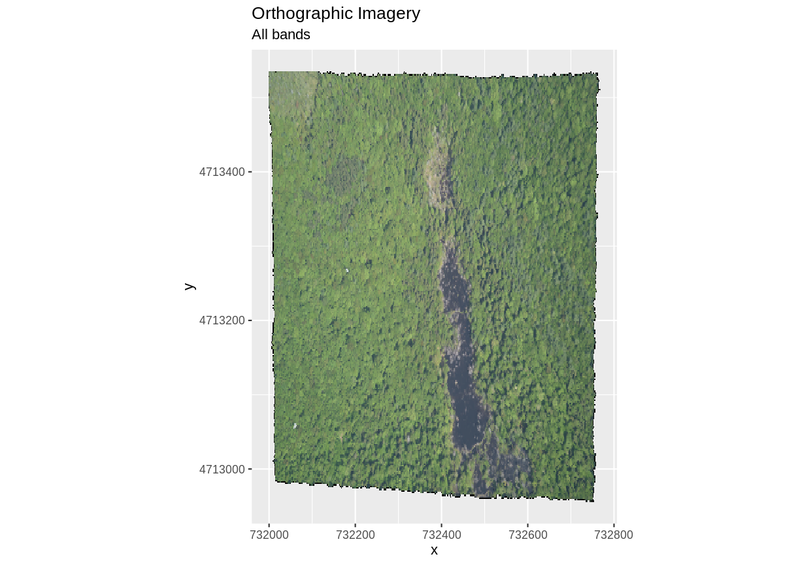 Describe the fundamental attributes of a raster dataset. 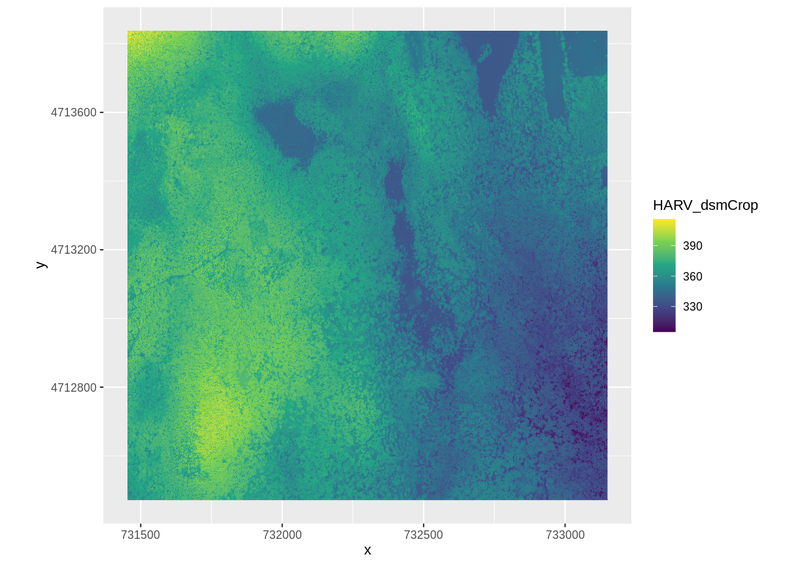 Explore raster attributes and metadata using R.
Import rasters into R using the raster package. Plot a raster file in R using the ggplot2 package. Describe the difference between single- and multi-band rasters. In this episode, we will introduce the fundamental principles, packages and metadata/raster attributes that are needed to work with raster data in R. We will discuss some of the core metadata elements that we need to understand to work with rasters in R, including CRS and resolution. We will also explore missing and bad data values as stored in a raster and how R handles these elements. We will continue to work with the dplyr and ggplot2 packages that were introduced in the Introduction to R for Geospatial Data lesson. We will use two additional packages in this episode to work with raster data - the raster and rgdal packages. Make sure that you have these packages loaded. If not already discussed, introduce the datasets that will be used in this lesson. A brief introduction to the datasets can be found on the Geospatial workshop homepage. For more detailed information about the datasets, check out the Geospatial workshop data page. We will be working with a series of GeoTIFF files in this lesson. The GeoTIFF format contains a set of embedded tags with metadata about the raster data. We can use the function GDALinfo() to get information about our raster data before we read that data into R. It is ideal to do this before importing your data. Each line of text that was printed to the console is now stored as an element of the character vector HARV_dsmCrop_info. We will be exploring this data throughout this episode. By the end of this episode, you will be able to explain and understand the output above. Now that we’ve previewed the metadata for our GeoTIFF, let’s import this raster dataset into R and explore its metadata more closely. We can use the raster() function to open a raster in R.
To improve code readability, file and object names should be used that make it clear what is in the file. The data for this episode were collected from Harvard Forest so we’ll use a naming convention of datatype_HARV. First we will load our raster file into R and view the data structure. You may not see major differences in summary stats as maxsamp increases, except with very large rasters. To visualise this data in R using ggplot2, we need to convert it to a dataframe. We learned about dataframes in an earlier lesson. The raster package has an built-in function for conversion to a plotable dataframe. Now when we view the structure of our data, we will see a standard dataframe format. We can use ggplot() to plot this data. We will set the color scale to scale_fill_viridis_c which is a color-blindness friendly color scale. We will also use the coord_quickmap() function to use an approximate Mercator projection for our plots. This approximation is suitable for small areas that are not too close to the poles. Other coordinate systems are available in ggplot2 if needed, you can learn about them at their help page ?coord_map. More information about the Viridis palette used above at R Viridis package documentation. This map shows the elevation of our study site in Harvard Forest. From the legend, we can see that the maximum elevation is ~400, but we can’t tell whether this is 400 feet or 400 meters because the legend doesn’t show us the units. We can look at the metadata of our object to see what the units are. Much of the metadata that we’re interested in is part of the CRS. We introduced the concept of a CRS in an earlier lesson. Now we will see how features of the CRS appear in our data file and what meanings they have. We can view the CRS string associated with our R object using thecrs() function. What units are our data in? +units=m tells us that our data is in meters. The CRS for our data is given to us by R in proj4 format. Let’s break down the pieces of proj4 string. The string contains all of the individual CRS elements that R or another GIS might need. Each element is specified with a + sign, similar to how a .csv file is delimited or broken up by a ,. After each + we see the CRS element being defined. For example projection (proj=) and datum (datum=). proj=utm: the projection is UTM, UTM has several zones. Note that the zone is unique to the UTM projection. Not all CRSs will have a zone. Image source: Chrismurf at English Wikipedia, via Wikimedia Commons (CC-BY). It is useful to know the minimum or maximum values of a raster dataset. In this case, given we are working with elevation data, these values represent the min/max elevation range at our site. If the minimum and maximum values haven’t already been calculated, we can calculate them using the setMinMax() function. We can see that the elevation at our site ranges from 305.0700073m to 416.0699768m. The Digital Surface Model object (DSM_HARV) that we’ve been working with is a single band raster. This means that there is only one dataset stored in the raster: surface elevation in meters for one time period. A raster dataset can contain one or more bands. 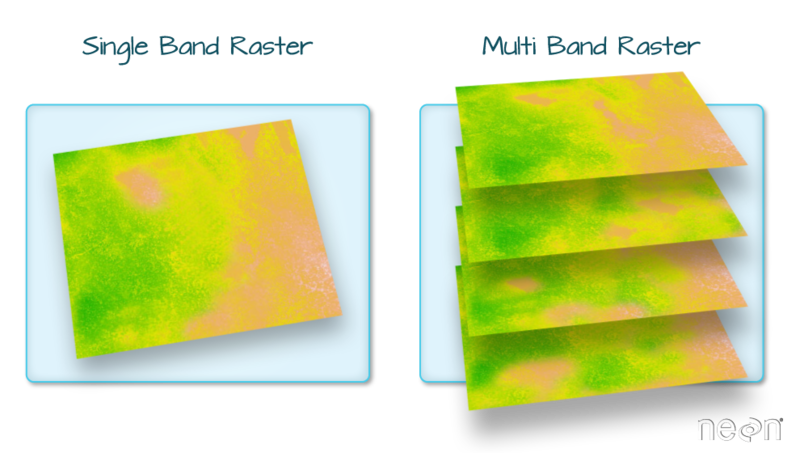 We can use the raster() function to import one single band from a single or multi-band raster. We can view the number of bands in a raster using the nlayers() function. However, raster data can also be multi-band, meaning that one raster file contains data for more than one variable or time period for each cell. By default the raster() function only imports the first band in a raster regardless of whether it has one or more bands. 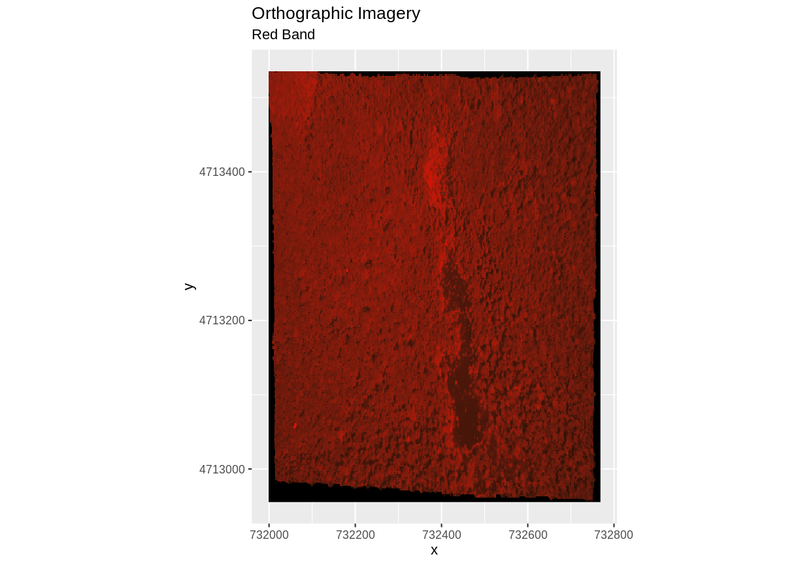 Jump to a later episode in this series for information on working with multi-band rasters: Work with Multi-band Rasters in R.
Raster data often has a NoDataValue associated with it. This is a value assigned to pixels where data is missing or no data were collected. By default the shape of a raster is always rectangular. So if we have a dataset that has a shape that isn’t rectangular, some pixels at the edge of the raster will have NoDataValues. This often happens when the data were collected by an airplane which only flew over some part of a defined region. In the image below, the pixels that are black have NoDataValues. The camera did not collect data in these areas. In the next image, the black edges have been assigned NoDataValue. R doesn’t render pixels that contain a specified NoDataValue. R assigns missing data with the NoDataValue as NA. The difference here shows up as ragged edges on the plot, rather than black spaces where there is no data. If your raster already has NA values set correctly but you aren’t sure where they are, you can deliberately plot them in a particular colour. This can be useful when checking a dataset’s coverage. For instance, sometimes data can be missing where a sensor could not ‘see’ its target data, and you may wish to locate that missing data and fill it in. The value that is conventionally used to take note of missing data (the NoDataValue value) varies by the raster data type. For floating-point rasters, the figure -3.4e+38 is a common default, and for integers, -9999 is common. Some disciplines have specific conventions that vary from these common values. In some cases, other NA values may be more appropriate. An NA value should be a) outside the range of valid values, and b) a value that fits the data type in use. For instance, if your data ranges continuously from -20 to 100, 0 is not an acceptable NA value! Or, for categories that number 1-15, 0 might be fine for NA, but using -.000003 will force you to save the GeoTIFF on disk as a floating point raster, resulting in a bigger file. If we are lucky, our GeoTIFF file has a tag that tells us what is the NoDataValue. If we are less lucky, we can find that information in the raster’s metadata. If a NoDataValue was stored in the GeoTIFF tag, when R opens up the raster, it will assign each instance of the value to NA. Values of NA will be ignored by R as demonstrated above. Use the output from the GDALinfo() function to find out what NoDataValue is used for our DSM_HARV dataset. NoDataValue are encoded as -9999. Bad data values are different from NoDataValues. Bad data values are values that fall outside of the applicable range of a dataset. The normalized difference vegetation index (NDVI), which is a measure of greenness, has a valid range of -1 to 1. Any value outside of that range would be considered a “bad” or miscalculated value. Reflectance data in an image will often range from 0-1 or 0-10,000 depending upon how the data are scaled. Thus a value greater than 1 or greater than 10,000 is likely caused by an error in either data collection or processing. Sometimes a raster’s metadata will tell us the range of expected values for a raster. Values outside of this range are suspect and we need to consider that when we analyze the data. Sometimes, we need to use some common sense and scientific insight as we examine the data - just as we would for field data to identify questionable values. Plotting data with appropriate highlighting can help reveal patterns in bad values and may suggest a solution. Below, reclassification is used to highlight elevation values over 400m with a contrasting colour. We can explore the distribution of values contained within our raster using the geom_histogram() function which produces a histogram. 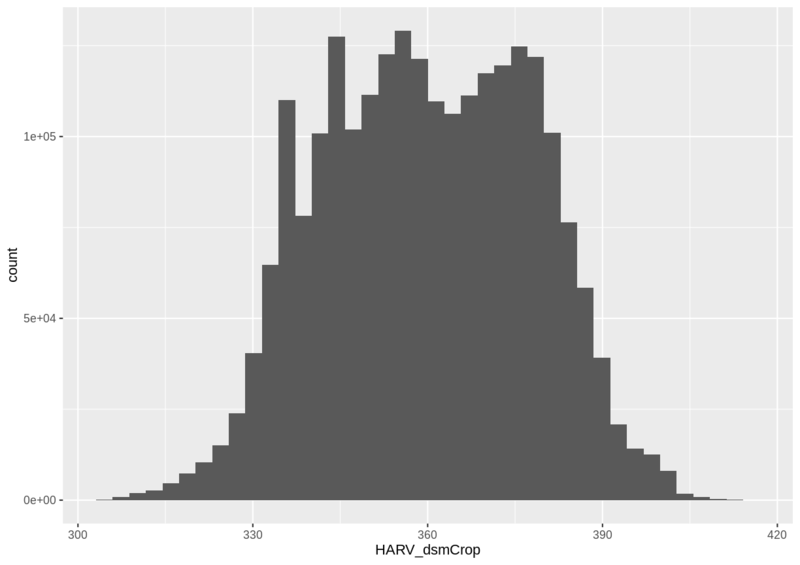 Histograms are often useful in identifying outliers and bad data values in our raster data. Notice that a warning message is thrown when R creates the histogram. stat_bin() using bins = 30. Pick better value with binwidth. This warning is caused by a default setting in geom_histogram enforcing that there are 30 bins for the data. We can define the number of bins we want in the histogram by using the bins value in the geom_histogram() function. 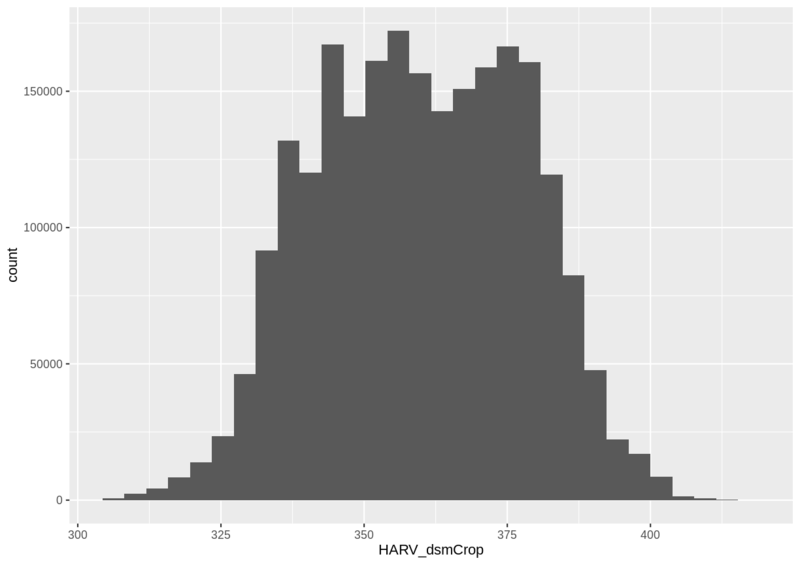 Note that the shape of this histogram looks similar to the previous one that was created using the default of 30 bins. The distribution of elevation values for our Digital Surface Model (DSM) looks reasonable. It is likely there are no bad data values in this particular raster. Does this file have the same CRS as DSM_HARV? What is resolution of the raster data? How large would a 5x5 pixel area be on the Earth’s surface? Is the file a multi- or single-band raster? Notice: this file is a hillshade. We will learn about hillshades in the Working with Multi-band Rasters in R episode. If this file has the same CRS as DSM_HARV? Yes: UTM Zone 18, WGS84, meters. How large a 5x5 pixel area would be? 5mx5m How? We are given resolution of 1x1 and units in meters, therefore resolution of 5x5 means 5x5m. Is the file a multi- or single-band raster? Single. 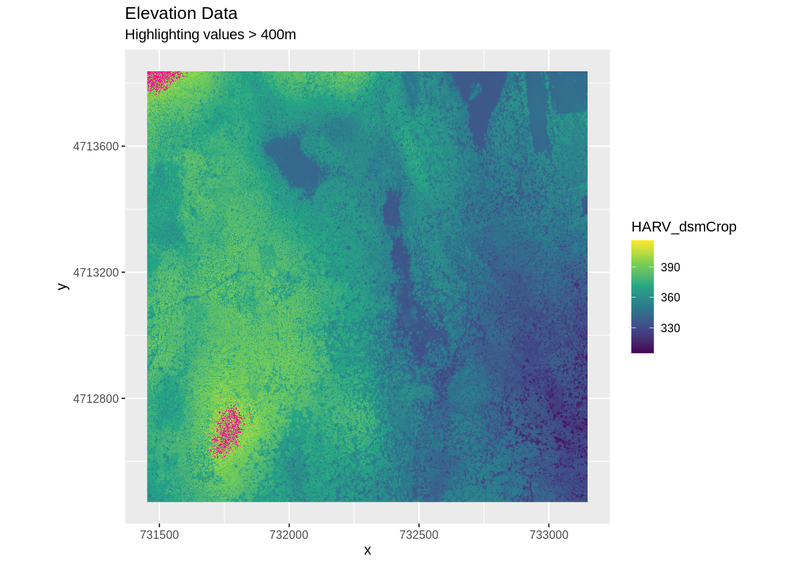 Read more about the raster package in R.